I've decided not to give up on the X-Pro 1 yet, and have gone back to using a (revised) version of the workaround I posted some time ago. This involves creating a raw file. First I create a Tiff from the raw file in SilkyPix using a modified Super Neutral Setting. This involves making the file low contrast, turning all sharpening off and setting the dynamic range expansion slider to maximum. I then import this tiff file into Adobe Camera Raw and create a .dng file. I then process these created .dng files using these settings. Above is a 100% blowup of a raw file processed using my custom settings. As in the example I posted yesterday there is a distinct "watercolour effect"
Below is a 100% blowup using the same sharpening parameters as above and as you can see this is a much more "normal" sharpened look. If you can't see the difference well enough click on image below > flikr > Actions > View all sizes > Original. And yes, its complicated, long winded, over-elaborate and shouldn't be necessary. And yes again its my highly personal take on what constitutes a good raw file conversion. However the files I can produce using this method are what I want, are very similar to what I can get from my other cameras and are very sharp and crisp. They also look very much like I would expect from a camera with no AA filter. If you are interested to see what my "RAW" file looks like there's a link to a .dng version below. 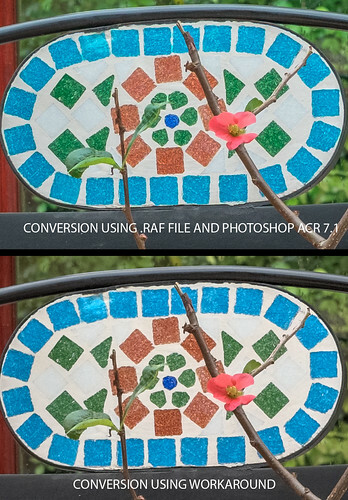 It should work with all versions of Photoshop and Lightroom, but it may not look right in anything other than the latest ACR update in both programmes. There are also further links to discussions and samples of this issue below.